Last edited by sydney on Mon Jul 02, 2018 7:21 pm, edited 1 time in total. Looking forward to this, another one I had as a kid but I've not played for years. 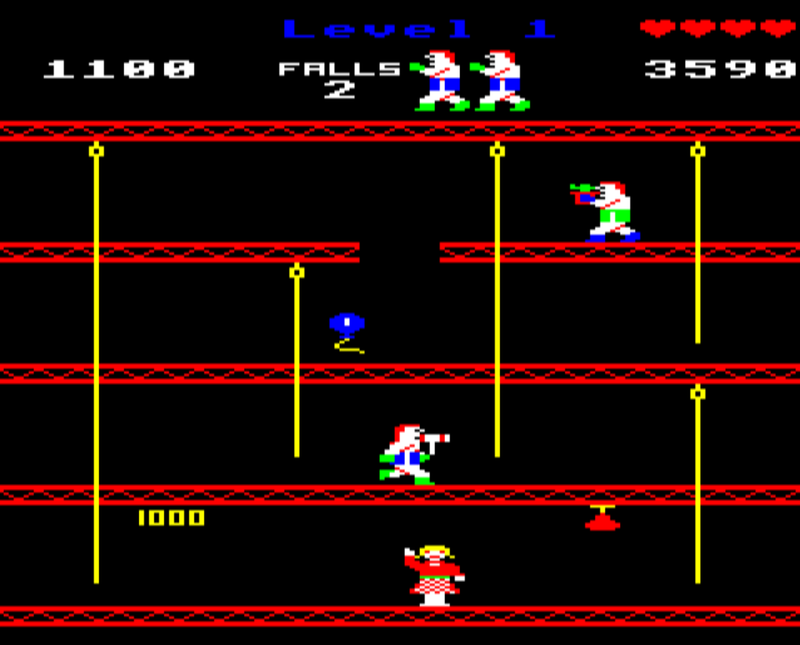 I had this one free with my Electron back in the day, so again one of the first games I ever played. Feels a little clunky by today's standards (even BITD it felt a bit like that) but it's still enjoyable. Not in the same stratosphere as our champ but it's a start. I've never played this one before. I got to the 2nd round somehow but don't know how. I don't see that in the instructions. I think I'd be doing much better if I knew that or..... is that a 'discoverable? Edit: Never mind, I didn't read the first page of instructions carefully enough. Last edited by KarateEd on Mon Jul 02, 2018 9:20 pm, edited 1 time in total. Er, I clocked it... got to level 6, round 3. Certainly better than I ever did BITD. I am just going to upload my really poor score and say I clocked it. Might try it on a real 'puter as the emulator is tying my fingers in knots. Might give joysitck a go. I am sure I have played this game recently or maybe saw someone else play it and I was watching. Cant remember where though. 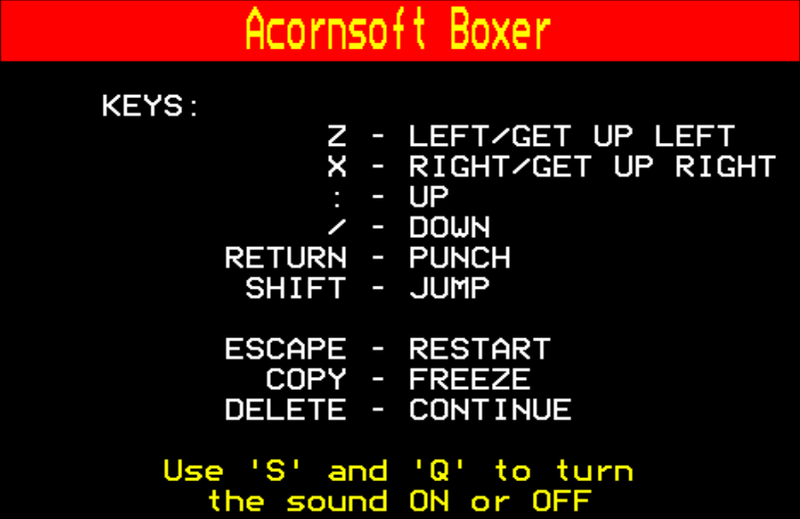 One of the first games I ever played (was free with my Electron too from Currys - part of a 5 pack of Acornsoft games) got played loads, nice little game. Got to level 6, round 3 again, but with a slightly better score. Huge amounts of luck in this game. Skill and quick reactions will help you, but you'll still get plenty of unfair situations where there's nothing you can do. Managed to get to what would've been level 8 round 3 here, although the difficulty tops out at level 6 and that just keeps repeating level 6 after that point. The difficulty in level 6 is pretty brutal - you've got a matter of a few seconds to pick up each baloon, so you've got to take big risks to even stand a chance. Last edited by Elminster on Sat Jul 07, 2018 11:39 pm, edited 1 time in total. The game shows the instructions when you load it. Not on the version I am using. Just shows the keys. Was using electron version on MGC cart. Will try the one above. Maybe instructions stripped from mine. Edit2: ah I never bothered to collect ballons, explains why I never progressed! Last edited by Elminster on Sun Jul 08, 2018 3:38 pm, edited 2 times in total. I had the same issues at first Elminster. Promised photo of 'high school' [edit: score] pre-reading the instructions! Last edited by Elminster on Mon Jul 09, 2018 9:16 am, edited 1 time in total. Had a nice run today, it's such a random game with heaps of luck involved. Last edited by KarateEd on Mon Jul 09, 2018 11:43 pm, edited 1 time in total. Moved up slightly again, this time on real hardware. The FU fighters didn't do as well. Last edited by KarateEd on Tue Jul 10, 2018 6:22 am, edited 1 time in total. Last edited by KarateEd on Thu Jul 12, 2018 2:06 pm, edited 1 time in total. Last edited by KarateEd on Thu Jul 12, 2018 2:03 pm, edited 4 times in total. Last edited by KarateEd on Thu Jul 12, 2018 5:44 pm, edited 2 times in total.